Steel is basically an alloy of iron and carbon to which sometimes other elements are added to achieve certain properties for specific performance of the steel. It is the most common material which the people come into contact with every moment, all the day and every day. There is hardly any object that people use today which does not contain steel or which is not created with equipment made of steel. In fact, today it is hard to imagine a life without the use of steel in some shape or form. One has to just think of what would be missing in everyday life if there is no steel. Mass production of steel started late in the nineteenth century. From that time onwards steel has become the material of choice in most of the applications which make the daily lives of the people possible. This position of steel is due to its versatility, strength, and recyclability. The versatility of steel is well known. It can be used in diverse applications which includes transportation, infrastructure, building structures etc. on one side and sewing needles, screws for laptops, mother board sheets for mobile phones, springs for wrist watches and many others such smaller applications. Ballpoint pens rely on a steel sphere less than 1 mm in diameter to dispense ink. Steel can also be used in a wide variety of atmospheres which include extremes of cold and hot climates as well as in both arid and wet climates. World today depends on the strength of steel. Steel makes it possible to build skyscrapers and long span bridges since it has strength, rigidity and durability. Tankers and bulk carriers which help in moving resources across the world are made of steel. Wind mills and solar farms which generate renewable energy are dependent on steel for their existence. Similarly, aircraft undercarriages rely on steel to perform every time an airplane takes off and lands. Use of steel is indispensable while meeting the challenge of efficient use of the resources. There are limitless possibilities in the usage of steel. Its strength-to-weight ratio is the highest of any building material. It can be easily formed and joined. It can withstand natural disasters including hurricanes and earthquakes. It is also impervious to attacks from termites or fungi. There are several thousands of different varieties of steels with different properties. In addition, new steels are being developed every year. The large variety of steels which are being made for use in different applications can be broadly categorized in the following types. Carbon steel is the most common type of steel. Steel is considered to be carbon steel (i) when no minimum content is specified or required for chromium, cobalt, niobium, molybdenum, nickel, titanium, tungsten, vanadium or zirconium, or any other element to be added to obtain a desired alloying effect, (ii) when the specified minimum for copper does not exceed 0.40 %, or (iii) when the maximum content specified for any of the following elements does not exceed the percentages noted namely (i) manganese – 1.65 %, (ii) silicon – 0.60 %, and (iii) copper – 0.60 %. Carbon steels are normally categorized into the following types. Ultra low carbon steels – These steels contain very low carbon (less than 0.10 %), very low manganese, and very low silicon and have extra deep drawing properties. Low carbon steels – These steels contain carbon up to 0.30 %. This steel category includes mild steel with carbon content usually in the range of 0.15 % – 0.30 %. Medium carbon steels – These steels are similar to low carbon steels except that the carbon content in these steels are higher and normally in the range of 0.31% to 0.60 % with the manganese content ranging from 0.60 % to 1.65 %. Due to the increased carbon content, the medium carbon steels can be used in the quenched and tempered condition. High carbon steels – These steels have carbon content ranging from 0.61 % to 1.00% with the manganese content ranging from 0.30 % to 0.90 %. Ultrahigh carbon steels – These steels contains carbon in the range of 1.25 % to 2.0 %. These steels are normally thermo-mechanically processed to produce microstructures consisting of ultra-fine, equi-axed grains of spherical, discontinuous pro-eutectoid carbide particles. High strength low alloy steels are also known as the micro-alloyed steels. These steels are designed to meet the specific requirement of mechanical properties rather than a chemical composition. These steels are designed to provide better mechanical properties and/or greater resistance to atmospheric corrosion than conventional carbon steels. The carbon content in these steels may range from 0.05 % to 0.25 % and manganese content up to 2.0 % in order to provide adequate deep drawing and welding properties. In these steels, small quantities of chromium, nickel, molybdenum, copper, nitrogen, vanadium, niobium, titanium and zirconium are also used in various combinations. These steels can also have small additions of calcium, rare earth elements, or zirconium for sulphide inclusion shape control. Advanced high strength steels have been developed for automotive applications. These automotive grades are different when compared with the conventional low and high strength steels. These steels have superior mechanical properties which are developed in it due to the steel’s structure and due to its distinct processing. Advanced high strength steels are manufactured by adopting control cooling from austenite or austenite plus ferrite phases on the run out roller table in a hot rolling mill or in the cooling section of a continuous annealing furnace in cold rolled product. Some types of these steels are (i) dual phase steel, (ii) transformation induced plasticity steel, (iii) complex phase steel, (iv) martensitic steel, (v) ferritic bainitic steel, (vi) twinning induced plasticity steel, (vii) hot formed steel, and (viii) post forming heat treatable steel. The term ‘Interstitial Free steel’ refers to the fact, that there are no interstitial solute atoms to strain the solid iron lattice, resulting in very soft steel. Interstitial Free steels have interstitial free body centered cubic (bcc) ferrite matrix. These steels normally have low yield strength, high plastic strain ratio, high strain rate sensitivity, and good formability. Interstitial Free steels have ultra-low carbon content, achieved by removing carbon monoxide, hydrogen, nitrogen, and other gasses during steelmaking through a vacuum degassing process. Interstitial elements like nitrogen or carbon are also in the form of nitrides and carbides due to the alloying elements such as Nb and/or Ti used for the stabilization of the residual interstitials. Therefore, this steel possesses typically non aging properties. Low alloy steels are steels which show mechanical properties superior to the properties of plain carbon steels due to the additions of alloying elements like nickel, chromium, and molybdenum. Total alloy content in these steels can vary from 2.01 % up to the levels of 8 %. Some people define low alloy steels as those steels which contain alloying elements up to 4 %. In most of the low alloy steels, the primary function of the alloying elements is to increase hardenability so as to optimize the mechanical properties and toughness after heat treatment. However in some cases, the addition of alloying elements is done to reduce environmental degradation of steels for specified service conditions. High alloy steels have alloying elements in their composition which is more than the low alloy steels. These elements are normally metals. They are intentionally added to incorporate certain properties. There are a large numbers of alloying elements which can be added to steel. Total amount of alloying elements in high alloy steels can vary between 8 % and 50 %. Common alloying elements include manganese, nickel, chromium, molybdenum, vanadium, silicon, and boron. Less common alloying elements include aluminum, cobalt, copper, cerium, niobium, titanium, tungsten, tin, zinc, lead, antimony and zirconium. Chromium, vanadium, molybdenum, and tungsten when added to steels improve strength by forming second phase carbides. Manganese, silicon, nickel, and copper are added to increase strength of the steels by forming solid solutions in ferrite. Addition of small quantities of nickel and copper improve corrosion resistance. Molybdenum addition in steel helps to resist embrittlement. Zirconium, cerium, and calcium increase toughness in alloy steels by controlling the shape of inclusions. Manganese sulphide, lead, bismuth, selenium, and tellurium increase machinability. There are several categories of alloy steels. Some of them are (i) constructional alloy steels, (ii) alloy tool and die steels, (iii) high speed steels, (iv) special alloy steels, (v) Marageing steels, (vi) Hadfield manganese steel, and (vii) stainless steels. Stainless steel is a family of alloys of iron that contains at least 10.5% chromium and a maximum of 1.2 % carbon which is essential of ensuring formation of a self-healing surface passive layer. This passive layer provides the corrosion resistance. These steels are valued for high corrosion resistance. They are around 200 times more resistant to corrosion than mild steel. This characteristic makes stainless steels totally different from mild steels. Stainless steels are characterized by corrosion resistance, aesthetic appeal, heat resistance, low life cycle cost, full recyclability, biological neutrality, ease of fabrication, cleanability, and good strength to weight ratio. 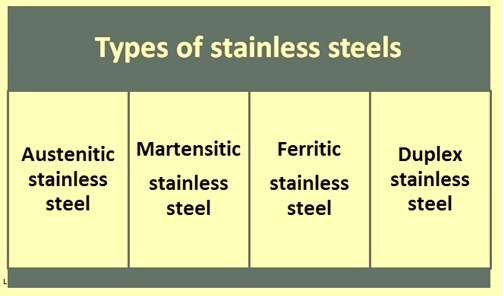 The family of stainless steels can be grouped into four types (Fig 1) namely (i) austenitic stainless steels, (ii) martensitic stainless steels, (iii) ferritic stainless steels, and (iv) duplex stainless steels. Each of these types has specific properties and a basic grade. Austenitic steels are non-magnetic and non-heat treatable. They generally contain 18 % chromium, 8 % nickel and less than 0.8 % carbon. Ferritic stainless steels contain trace amounts of nickel, 12 % to17 % chromium, and less than 0.1 % carbon, along with other alloying elements, such as molybdenum, aluminum or titanium. Ferritic stainless steels are magnetic steels which cannot be hardened with heat treatment, but can be strengthened by cold work. Martensitic stainless steels contain 11 % to 17 % chromium, less than 0.4 % nickel and up to 1.2 % carbon. These steels are magnetic and heat treatable and are used in knives, cutting tools, as well as dental and surgical equipment. Duplex stainless steels belong to the stainless steels family and are characterized by high chromium (19 % to 32 %) and molybdenum (up to 6 %) and lower nickel contents than austenitic stainless steels and identified by a dual phase microstructure. They have a well-balanced two phase structure. The two phases in their microstructure consist of grains of ferritic and austenitic stainless steels. Electrical steels are special steels which are tailored to exhibit certain specific magnetic properties such as small hysteresis area (small energy dissipation per cycle or low core loss) and high permeability. It is also called lamination steel, silicon steel, silicon electrical steel or transformer steel. The steel contains specific percentage of silicon in it which is responsible for its unique property. Electrical steels can have from zero to 6.5 % silicon but usually has silicon content up to 3.2 % (higher concentrations usually provoke brittleness during cold rolling). Manganese and aluminum can be added in these steels up to 0.5 %. Silicon significantly increases the electrical resistivity of the steel, which decreases the induced eddy currents and narrows the hysteresis loop of the material, thus lowering the core loss. Fire resistant steels have higher yield strength at elevated temperatures when compared to carbon steels. Japanese Industrial Standard specifies that the 0.2 % proof stress of fire resistant steels at 600 deg C must retain at least 2/3 of the value at ambient temperature. In other aspects, at ambient temperature, fire resistant steels have the performance and weldability similar to carbon steels. Basically, these steels have similar chemical composition to carbon steel of same strength grade, but have additions of chromium, molybdenum and other alloying elements to improve the yield point at the high temperatures. Free cutting steels also known as free machining steels are those steels which form small chips when machined. Free cutting steels are usually carbon steels which have sulphur, lead, bismuth, selenium, tellurium, or phosphorus added to it. Presence of these elements imparts the properties necessary for free machining since it basically ensures easy dispersal of chips during machining, thereby reducing the machining force, and improving tool life and surface finish of the machined component. Heat resistant steels are meant for use at temperatures higher than 500 deg C since they have got good strength at this temperature and are particularly resistant to short and long term exposure to hot gases and combustion products at temperature higher than 500 deg C. In heat resistant steels, the two most important elements are chromium for oxidation resistance and nickel for strength and ductility. Generally there are two fundamental classes of heat resistant steels. These are (i) ferritic/martensitic heat resistant steels, and (ii) austenitic heat resistant steels. Spring steels are used for the production of the springs. These steels feature the unique characteristic of being able to withstand considerable twisting or bending forces without any distortion. Products made from these steels can be bent, compressed, extended, or twisted continuously, and they will return to their original shape without suffering any deformation. This characteristic is defined as high yield strength and is due to the result of the specific composition and hardening of the steels. Spring steels are stainless, low alloy, medium or carbon steels manufactured to very high yield strengths. Spring steels are also used when there are special requirements on rigidity or abrasion resistance. Spring steels are to meet the requirements namely (i) high elastic limit, (ii) high ultimate strain, (iii) high contraction at fracture, (iv) good creep rupture strength, (v) good endurance limit, and (vi) low surface decarburization. The above special requirements of spring steels are being met by adding different alloying elements in the steels. These are silicon, manganese, chromium, vanadium, molybdenum and nickel (in case of stainless steels). Most of the spring steels are hardened and tempered to about 45 Rockwell C. Generally springs are made with high carbon spring steels, alloy spring steels and stainless spring steels. Galvanized steels are those steels to which a protective zinc coating is applied to the steel in order to prevent it from rusting. The term is derived from the name of Italian scientist Luigi Galvani. Galvanized steel which are basically coated with zinc include a range of hot dip galvanized and electro-galvanized steel products. Zinc weathers at a very slow rate, so the coating generally has a long life. Zinc has a greater electro-negativity than iron and hence provides cathodic (or sacrificial) protection to the steel. This results in the zinc corroding in preference to the steel if the coating is chipped or damaged to expose the base metal. Besides acting as galvanic protector, the other functions of the zinc layer are (i) to retain the steel intact with its full initial strength, (ii) to provide the surface a more pleasing appearance, (iii) to increase the life of any suitable organic finishing system applied over it, and (iv) to protect the steel from corrosive attack in most atmospheres, acting as a continuous and lasting shield between steel and the atmosphere. Tin free steel is an electrolytic chrome plated steel consisting of a thin layer of chromium and a layer of chromium oxide deposited on a cold rolled steel base (black plate steel) which gives it a beautiful, lustrous metallic finish on both sides. It is also known as electrolytic chromium coated steel. Tin free steel offers outstanding corrosion resistance, lacquer adhesion as well as printability. It is an economical and is high quality replacement for tinplate. It is not suitable for soldering and can only be used for welding after edge cleaning. Electrolytic chromium coated steel is to be lacquered on both surfaces. Tin plate is a thin steel sheet coated by tin. The thin steel sheet on which tin coating is done is known as black plate. Tin has several properties which make it suitable for use as a coating on steel. It has a good resistance to corrosion in a wide range of environments and in particular retains its appearance and surface properties extremely well in indoor atmosphere. It is easily soldered and the good corrosion resistance ensures effective retention of solderability. Thermo mechanical control process steels are those steels which are produced by this process. Thermo mechanical control processing is a microstructural control technique combining controlled rolling (thermo mechanical rolling) and controlled cooling (accelerated cooling). These steels are sometimes micro-alloyed. Thermo mechanical control process is normally used to obtain excellent properties for steel plates such as high strength, excellent toughness along with excellent weldability through maximizing of grain refinement. These steels have almost same formability and weldability compared with mild steels. The superior mechanical properties introduced to the steel through this processing route are virtually equivalent to those obtained by heat treating conventionally rolled or forged steel and hence thermo mechanical control process is used as a substitute for heat treatments that require additional material handling and furnace facilities. The term tool steel is a generic description for those steels which have been developed specifically for tooling applications. These steels are used for making tools, punches and dies etc. Tools used for working steels and other metals must be stronger and harder than the steels or the materials they cut or form. Normally tool steels are known for their distinctive toughness, resistance to abrasion, their ability to hold a cutting edge, and/or their resistance to deformation at elevated temperatures (red hardness). The metallurgical characteristics of various compositions of tool steels are extremely complex. There are hundreds of different types of tool steels available and each may have a specific composition and end use. Tool steels are mainly medium to high carbon steels with specific alloying elements added in different amounts to provide it special characteristics. The carbon in the tool steel is provided to help harden the steel to greater hardness for cutting and wear resistance while alloying elements are added to the tool steel for providing it greater toughness or strength. In some cases, alloying elements are added to retain the size and shape of the tool during its heat treat hardening operation or to make the hardening operation safer and to provide red hardness to it so that the tool retains its hardness and strength when it becomes extremely hot. Various alloying elements in addition to carbon are chromium, cobalt, manganese, molybdenum, nickel, tungsten, and vanadium. Weathering steels are weather resistant steels which work by controlling the rate at which oxygen in the atmosphere can react with the surface of the steel. These steels are high strength low alloy steels which can provide corrosion protection without additional coating. Increase in alloying elements, mainly copper, provides an arresting mechanism to atmospheric corrosion in the steel itself. The alloying elements in the steel produce a stable and durable rust layer that adheres to the base metal. This rust ‘patina’ develops under conditions of alternate wetting and drying to produce a protective barrier, which impedes further access of oxygen and moisture. This patina acts as a skin to protect the steel substrate. Section loss on the order of 2.5 mm can be expected before the patina sets up, but this is negligible to the structural performance.